I sincerely hope that your 2011 is off to a great start and that it will be filled with Happiness! Oh Im so glad you are here to HOP along with us for this very special BLOG-HOP!!! If you arrived here from the main House-Mouse & Friends Monday Challenge blog, then you are in the right place. If not, please go back to the main post and start there for all the HOP details. Stamps: Stampabilities, House-Mouse Designs, called "Olive A Party", from 1995, # HMUR1005, and featuring Maxwell & Mudpie". Not only that, but there are additional fabulous*Hidden* PRIZES on DT's BLOGS just for you! Isnt that awesome??? All you need to do to win any of the hidden prizes is leave love everywhere (comments), on BLOG-HOP links for DT, Guests & main HM&F MC blog-hop post! To WIN our Sponsored Prizes, you MUST also create a project for this New Beginnings Challenge! This great challenge will only run until 8:00pm EST, Sunday, January 16th, 2011. So get HOPPING, commenting and creating your New Beginnings projects! :) We cant wait to see what you come up with! That image is so cute!!! What a great New Year card! ohhh wow love the layout and the DP. whow what a lovely card!!! your collors and embelissement are great! Awesome creation Teamie as always stunning take on the chall. Love it America. Great theme, layout and coloring. Hope the new year treats you awesome. Love the detail on your card! The glass and party hats in the bottom corners are just the right touch! Hi Wow gorgeous card!! love that cute image and the 3d look is just fab! Wow, I love your New Year creation. I love this stamp and almost used it!! Beautiful details and coloring as always! Hi hunni - hope you're rested by the time you read this!!! Love your gorgeous card - the black and white papers are stunning, fabulously coloured cute image and your sparkly cardstock is awesome. I love all your stuff. Beautiful! I love the layout - very creative! Great card! Fabulous card! I love the theme, I love the martini, I love house mouses! Your holographic sparkliness works superbly with the black & white. Love how the streamers are echoed in the scalloped bottom card edge & how you have more of that holographic effect behind it. Delighfully classic & somehow elegant with cute! What a lovely card! I just got my first House Mouse stamp today, can't wait to use it. this image is truly the cutest! but your creation would have been wonderful anyways! love all the white and silver, which really makes the mice pop! You've made a gorgeous card with a beautiful image!! Happy New Year. Stunning card. Happy New Year. what a very beautiful card america. this image is very sweet. This is a great New Year's card. I like that image... it's just perfect! This is fabulous! tha perfect image for the occassion! Thanks for joining us at Creative Inspirations! What gorgeous elements on your creation, love your image too. Nice to work along side you on this hop. Oh wow, America, this is just awesome! Love the sparkle, the stamp, everything about it! Thanks for a fun, fun, fun blog hop! And Thank you for taking the Top Tip Tuesday Challenge and Happy New Year! Wow, what a fabulous party card! And your embellies are just perfect too! Gorgeous card love all the embellies that you have used. Beautiful work. Thanks for joining us at Ellephantastic this month. This is a fantastic card America! I love image and embellies. Really a brilliant idea. Thaks for playing us at DDCC this week. I hope to see agrain. Hugs and happy new year. This is a fabulous New Year's card, America! Those mice are having a very Happy New Year! sooooo cute...really love the image! thanks for joining us at creative friday! Love the image. Great job with the color selection. Love how you used the two different spellbinders dies and all the glimmer, beautiful! Adorable card!!! So festive looking. Thanks for the chance to win blog candy !!! Oh my goodness totally adorable! I love everything about it especially the black and white colour scheme. Fabulous New Years card! Love the white and silver...and of course the images is ADORABLE! What a fabulous card you made. I love it, it's a great New Years card! Oh, those mice are always having fun, aren't they? Love all the wonderful touches on this card. 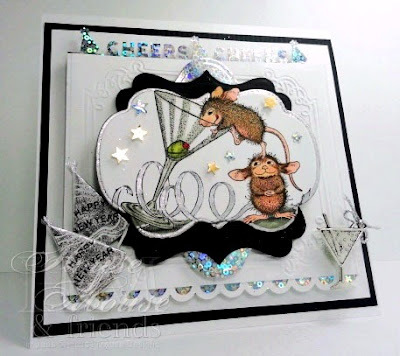 So glad to see your card with the Stampin B's 'celebrate' challenge this week. This is such a cute card, thanks for joining us at Creative Inspirations this week. I love your beautiful cards! It is so clean & neat! Love your Card, Happy New Year. And your card is great! I love all the glitter details and the cute image. Adorable new year's card! Thanks for hosting the hop! WOW this is absolutely fabulous that image along with your design is gorgeous thank you for joining us at Creative Inspirations. WOW, your card is awesome!! Great job! Thanks for joining us this week at Inky Impressions! I love that image. All the layering you did is fabulous. What a sweet image and card. Thanks for joining in at creative inspirations. Oh, so cute image! So festive card. Your card is absolutely stunning, love the image and the colours!! A house-mouse blog hop, what a fun event to find for a house-mouse fan! What a stunning card. Love the layout. Oh was für eine edle Karte. OMG, what a darling HM image and your have colored it beautifully!!!! I love your awesome design, too, and great colors....absolutely gorgoeus, America!!! Gorgeous card ... love the image and the white. This card is soooo darn cute! I love that holographic paper you used on it too!!! Incredible card! So many great embellishments with this adorable image. Happy New Year! Happy happy new year America! Love your sparkly card! The silver and white looks absolutely amazing together, and as always, your eye for details makes it so special! Gorgeous card, just love the image you have used and what a fantastic layout. Love it. OMG!!!!!!!! your card is beyond stunning I love, love the little hats in the corner, the details are amazing, Wow thanks for the insperation. Beautiful Card!!! Happy New Year! Wow!! This is so stunning America, I love the image and all that wonderful sparkle. Thank you for joining us at Creative Inspirations, One Stop Craft and the Fairy Fun Fridays this week with your lovely creation. Your card is fantastic!! Thanks for joining us at FFF, we look forward to seeing your future creations. As usual your card is absolutely fantastic. I always visit here when I need inspiration. Card is fantastic and so is this blog hop!! Great card, America! Thanks for sharing, and for helping give us a chance to win so many great prizes! Awesome card. Love the image, the papers you used and all the little details you added. Thanks for so many chances to win some great goodies. Beautiful card and love the fun image. Thanks so much for joining in with the Creative Inspirations challenge and good luck! Wonderful details, having fun hoppin' around. My HM card is #26. What a beautiful card!! Love this cute stamp! I've made a card with a new beginning for this great challenge too. You can find my card here!! Great card!!! Feel like wanna join that party! Beautiful card! Happy New Year to you and thanks for taking part in our first challenge of 2011! Hope to see you again next month! what a sweet new year card. I love it. What a beautiful card! I love that stamp, I've made a lot of cards with it for different occasions. Adorable! What great coloring of the mice, and your bg "labels" highlight them just perfectly. Stunning card - love the image. Thanks for a fun blog hop. Stunning card, I love the sparkling effects. Love the die cuts you have used with this image! Great new years card! what an adorable card full of glitter and sparkle, I love this stamp! A wonderful card! Love the image! Happy New Year Sweetie!! What a great card for the new year!! Love the coloring and pretty sparkle!! Just posted my card and I'm now a fan of the House Mouse. Your card is fabulous!! Love this image, so cute. Looks great with the black & white colour scheme. Wow what a lovely Cute Card, really love the house mouse stamps. Have a Happy Crafty New Year. Love this card! Beautiful colouring. This is so cute. I love it. House Mouse are some of my favourite stamps. What a fabulous card! I love the layers you created! And I love the sequin detailing! Great job! Thank you for sharing! What a fabulous card. Love the elegant crisp whites. Hi America, Happy new Year to you to.